The Dollar tumbled in the wake of the Fed's dovish commentary, weighing on US yields and paving the way for higher Gold prices. The Federal Reserve kept interest rates unchanged and the central bank also downgraded GDP for the balance of 2019 and 2020. They see unemployment moving slightly higher. The Fed also changed its dot plots which are the future forecast of prices providing more than enough support for the yellow metal to shine. 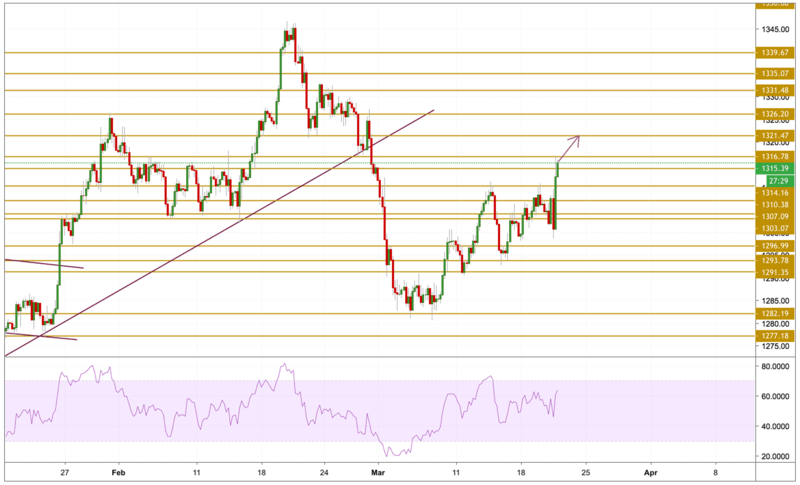 Gold prices edged lower during yesterday's session before surging back up, breaking the key resistance level at $1310.38 per ounce and printing a high of $1316.87. The price is currently hovering around the 1315.5 level and the upward move looks most certainly bullish as the momentum is getting stronger with more room to go before entering the overbought state.